Take 290 West towards Austin. Burton is about 8 miles west of Brenham (about 80 miles from Houston). At FM 1948 N, turn right and go 1 mile to entrance on right..
Take 290 East towards Houston. 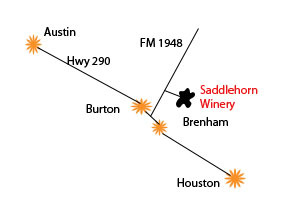 Burton is about 8 miles east of Carmine (about 80 miles from Austin). At FM 1948 N, turn left and go 1 mile to entrance on right. Enter and follow the road over the bridge to the winery.